Personalized sightseeing in a timeless city. Theme tours include: medieval, culinary, art, archeology, Judaic history and much more. Tours of Palermo at your own pace. Multicultural - of, relating to, or constituting several cultural or ethnic groups within a society. Those who ascribe "political correctness" or other "modern" motives to these two simple words must know nothing about the society that flourished in Sicily from about 1070 into the early decades of the thirteenth century. Without wishing to foist religion upon the most vocal cynics, one suggests that a visit to Sicily's largest church, affording us a long glance toward a more tolerant time, might change a few opinions. As fascinating as the Palatine Chapel and Monreale Abbey are, capturing a magical moment in European (and Asian and African) history, Palermo's cathedral presents to the visitor a diversity and mixture of architectural styles unique in the world for a church of this strikingly vast scale: Arab, Norman, Byzantine, Swabian, Romanesque, Gothic, Renaissance, Baroque. It's all here, in one grand, inspiring setting, complete with soaring medieval spires. This is the world's most eclectic ecclesiastical architecture. If there were ever a building that could lay claim to being the world's most architecturally diverse, "multicultural" place of worship, it would be this one. Built during the twelfth century on the site of a Roman temple, and a Byzantine basilica converted into a mosque, the cathedral is a masterpiece of Norman-Arab architecture embracing several additional styles throughout the Middle Ages and into the Renaissance and Baroque periods, yet transcending any single movement. Here we'll focus more on the medieval features incorporated into the cathedral before 1460 than on the later modifications. Today, Palermo's cathedral is known officially as "Santa Maria Assunta" or Saint Mary of the Assumption. Arab records mention the existence of a large "infidel" temple present on this site when they conquered Palermo in 831. This was turned into the Great Mosque. In early 1072, when the Normans wrested control of Palermo from the Saracens, Count Roger (Roger I) promptly saw to it that the great mosque was reconsecrated as a Christian church. It was in this earlier incarnation of the cathedral that Roger II was crowned in 1130. By way of introduction, Sicily's earliest churches, like others in the central and eastern Mediterranean, were built upon existing Greek or Roman temples during the Paleo-Christian era beginning in the final years of the Western Roman Empire. In Syracuse Cathedral the massive columns and wall of a temple form part of the structure, and Agrigento's Concord Temple spent several centuries of its like as a church. In Italy, the "Romanesque Basilica" style of ecclesiastical architecture owes much to this early influence. By the seventh century, following occupations by the Vandals and Visigoths, Sicily found herself under the sway of the Byzantine Empire, though for some decades the island's bishops answered to the Patriarchs of Rome rather than to the Patriarchs of Constantinople. At this time the early Church was essentially unified. The Sicilians spoke Greek, Latin or (often) both. There was not yet any distinct Italian or Sicilian language as we understand those concepts today. Palermo's first cathedral (by definition this is the ecclesial see of a bishop) was probably built around a Roman temple on the site of the present structure but perpendicular to it, extending across what is now the large square flanking the cathedral, and much of Punic Palermo was still very visible. Precious little is known of this original structure though some of its large foundation stones are preserved beneath the square. At least part of the Paleo-Christian church appears to have been destroyed ("vandalized") by Vandals between 440 and 468; the crypts or underground foundations of several churches in Palermo date from this era. By 604 a larger structure was being built on this site using some stones from the earlier one. We know little of it except that it conformed to styles popular in Greece and Italy during that era and was dedicated to Mary. This is what became the Byzantine cathedral and - in the ninth century - the Great Mosque. 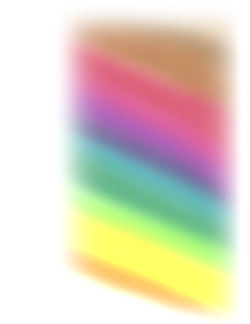 (An artists concept appears below.) It is believed that a few small sections of the present crypt were part of this Byzantine church. The Norman-Arab style was born in the eleventh century and flourished into the twelfth. The cathedrals of Cefalù and Monreale are typical. More accurately, the ephemeral style is Norman-Arab-Byzantine. In our photograph we've omitted the cupolas and other Baroque additions to present an impression of what the cathedral looked like toward the end of the Middle Ages circa 1460. The church was constructed on the orders of bishop Walter Ophamilias (often incorrectly referred to as Walter "of the Mill"), a cousin of the Hauteville kings, beginning in 1184. The young King William II, in an attempt to demonstrate his independence from Walter and various courtiers under whom he had spent his minority, had established a bishopric and splendid cathedral at Monreale, where he also spent time at a small royal palace. Walter's construction of Palermo Cathedral may be seen as a response to this - though it was difficult to rival Monreale Abbey. Until a series of modifications in 1781, the interior of the grand church retained its medieval form, which featured a wooden ceiling and at least a few mosaic icons. One is struck by the great church's size, which for its era made it one of Europe's largest places of worship. Overall, the edifice is still Sicily's largest church. Incredibly, the actual construction (like that of Monreale Abbey), took just a few years, even though the width of the "nave" is exceptionally broad for a Romanesque church of this architectural type. Twelfth-century Palermo, as one of the wealthiest cities of Europe (its revenue eclipsing that of all of Plantagenet England), boasted an immense corps of highly-competent artisans and workmen among Arabs and "Greeks." The modern preconception that medieval cathedral construction required many decades of labour is based on the intricacies of Gothic architecture. Splendid Cologne Cathedral, founded by Sicily's Frederick II, comes to mind. Whereas the floor plan of the earlier Byzantine cathedral was probably rather squarish (so far as we can infer from what little of its archeology is known to us), the Norman-Arab structure we see today is based on the typical "latin cross" design that foreshadowed the Gothic - a long nave and at least something of a transept. In that respect, Monreale Abbey is somewhat more "square" while Cefalù Cathedral is relatively (and literally) narrower, with a more developed transept, representing a more distinct step toward the Gothic. 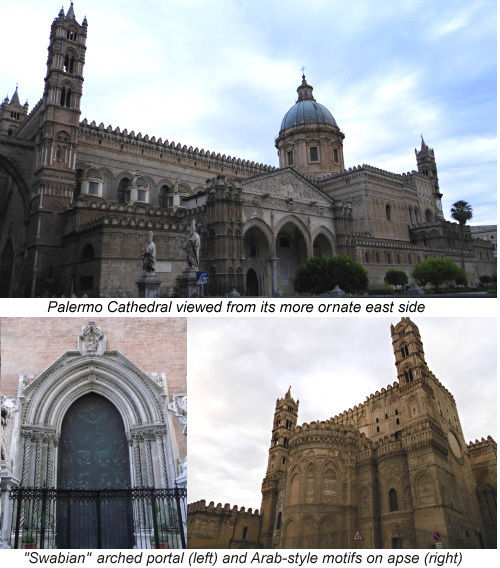 The cathedral of Palermo underwent major changes in the following centuries. Subtle Catalonian Gothic touches such as the portico, with its gargoyles - in the form of angels rather than grotesques - complement the original styles. Designed by Antonino Gambara, it was added in 1453. However, modern renovations and additions, such as the large cupola constructed in 1785, severely altered its appearance. This dome, and the extensive Baroque reconstruction of the interior, completely defaced the beautiful Norman Arab arches and lines of the inside of the church and corrupted the exterior's aesthetic lines. Among the Baroque features is Saint Rosalie's Chapel, commemorating Palermo's patron saint, possibly a Norman maiden, who repudiated the worldly life in favour of a hermit's existence in the caves of Mount Pellegrino overlooking the city. A grand festival is celebrated in her memory in mid-July. The meridian line in the floor is also a recent addition. The church is a massive rectangular structure, with two towers at the two front corners constructed in the Norman Arab style. The exterior of the apses is similar to those of Monreale Cathedral and the smaller Basilica of the Magione. The details are fascinating. In the relief carvings of the wooden door at the archway under the portico can be seen deer, boar and other game once hunted in Sicily but long extinct. There are also deerhounds, lizards and mythological and religious figures. The main entrance of the cathedral is located at the southern end of the nave along Via Bonello across the street from some reconstructed towers (the originals were destroyed by an earthquake) of the archdiocesan curia. The two arches over the street once supported a wooden roof. This entrance is used only on special occasions - usually when the archbishop enters the cathedral - but the facade reflects a succession of architectural styles, from the medieval Romanesque and Gothic through the Renaissance and into the Baroque. Adjacent to the church (on its western side), at the corner of Via Bonello and Via dell'Incoronazione, is the "Loggia dell'Incoronata," much altered since its construction in the twelfth century. Most of Sicily's newly-crowned Norman, Swabian and Aragonese kings ascended this arched platform to greet their applauding subjects immediately following a coronation mass in the cathedral. This reminds us, of course, that until the reign of Ferdinando I of the Two Sicilies (who died in 1825), most kings of Sicily (including the first, Roger II) were actually crowned in Palermo's cathedral, which is the episcopal seat of the Primate of Sicily, the Archbishop of Palermo, who is usually a cardinal. Even so, some of the cathedral's most inspiring features are not Latin (Roman Catholic) but Muslim or Byzantine (Eastern Orthodox) in inspiration. A few pieces of the Paleo-Christian, Byzantine and Arab structures were incorporated into the present cathedral. Several, though not very imposing, are worthy of note. The left-most pillar supporting the Gothic portico bears an inscription from the Koran. The pillars were probably incorporated into the Great Mosque of Bal'harm (as the Arabs called this city) before the arrival of the Normans (1071). as we've noted, the portico itself is a later addition. Another interesting detail is the Byzantine icon of the Theotokos (Mother of God) in a niche above the Gothic archway beneath the portico. This may have been part of the medieval Byzantine church which became the great mosque, though its origin is disputed. It would have been covered or removed when the church was converted to a mosque during the ninth century, then re-incorporated into the Norman church. However, it may well have been created specifically for the Norman church by some of the same Greek (Orthodox) artists who designed the mosaic icons elsewhere in and around Palermo long after the Great Schism of 1054. The geometric decorations of the apse exterior, not unlike those of Monreale Abbey, are of Islamic design, their symmetry reflecting Muslim thought and spirituality. This is also true of some of the decoration of the long walls on east side of the building, such as the geometrical "rosettes." Another Arab detail awaits us in the clerestory (actually an apse). In a corner can be seen part of a stone muqarnas ceiling similar those of the Zisa and (in wood) the Palatine Chapel. This originally covered a larger area when it probably formed part of the mosque. Beyond the Theotokos icon already mentioned, we know not to what extent the original walls were covered with mosaics. Certainly they were surpassed in spiritual expression and pure scope by those of Monreale, but there were probably a few large icons such as the Pantocrator of Cefalù's splendid cathedral. The side chapel that is located near the portico entrance of the church is famous for its royal tombs. It is here that King Roger II is buried, along with his daughter, Constance de Hauteville, mother of Emperor Frederick II Hohenstaufen, who is also laid to rest here. Henry VI Hohenstaufen, Holy Roman Emperor, father of Frederick and husband of Constance, is also entombed here. Frederick II, who besides being the King of Sicily was the Emperor of the Germans, has not been forgotten by the modern-day descendants of his Teutonic subjects. Even though Frederick has been dead for more than seven centuries, don't be surprised if you see German tourists leaving flowers at the foot of the Emperor's tomb. Other personages, including Bishop Walter himself, are interred in the crypt. Several areas of the cathedral, often (unfortunately) overlooked by visitors in a hurry, provide a fascinating insight into Palermo's medieval past. The Cathedral Treasury (Tesoro) is a small museum containing a collection of finely crafted religious objects. There are illuminated manuscripts here and bejeweled chalices and crucifixes, along with sophisticated gold jewelry adorned with Byzantine enamel-ware, and even a few metal icons. The queen's various jewelled rings are stunning to behold. Not every item is always on display, but one usually is - the treasury's most famous object, the Crown of Queen Constance of Aragon, wife of Frederick II. Don't expect a jewelled coronet. This is a much more intricate masterpiece of twelfth century metalwork combining Byzantine, Arabic and Western elements, made by the artisans of the palace workshops. Fragments of royal robes are also displayed, as well as episcopal vestments. The Crypt, as we've mentioned, houses the remains of Archbishop Walter, who in the twelfth century ordered construction of this cathedral, overlaying the earlier church and mosque, and sections of it may have been part of the original Byzantine structure. In addition to Walter, Saint Nicodemus, Orthodox bishop of Palermo in 1071, is also buried here. At one end is an altar in white marble bearing Byzantine mosaic detailing - perhaps transferred downstairs during the eighteenth-century remodeling - and a Roman sarcophagus from ancient Panormus. Unlike many other parts of the cathedral, the crypt retains its original form, with stark, heavy Romanesque arches and stonework. Quite obviously, a piece of a Punic wall of huge stones (incorporated into the earlier cathedrals) protrudes from the curved wall of an apse. The crypt open to visitors is not actually the deepest area of the cathedral complex; there are tunnels and ancient ruins - including the remains of catacombs - far beneath the church and under the large cathedral square. Nor is it the largest grave site nearby; a simple monument in the centre of Piazza Sett'Angeli, the open square behind the apse, commemorates the deaths of some two hundred people during an Allied bombing raid which in 1943 destroyed a building there, where the nameless dead are buried. The cathedral itself was virtually untouched by the hostilities. The term "clerestory" may be a misnomer, but that is how Palermitans refer to the interior apse chamber from which one descends into the cathedral's crypt. This chamber boasts a beautiful Romanesque-Gothic archway not unlike those leading into the cathedral from the portico and from Via Bonello. These ornate arches are thirteenth-century additions typical of their era. Though they were popularised in the Gothic churches of western Europe (of which there are very few pure examples in Sicily), they are, in fact, an element adopted from the earlier Romanesque style which predominated until the thirteenth century. During a restoration of the clerestory were revealed the muqarnas already described - perhaps created in the ninth or tenth century for the mosque but this too is a matter of scholarly debate. Here are also visible what appear to be small segments of the supporting walls of the earlier church and mosque. The carved wooden coro in Catalan Gothic style dates from1466. Like some other elements, this is the work of Francesco Lauranae and his team of artisans. The austere west walls on the "other" side of the cathedral (along Via dell'Incoronazione), though less detailed, include a few Arab-style windows and other medieval features along with Neoclassical columns at the side entrance. At the corner of this street and Via Bonello is the "Loggia" (royal dais) already mentioned. What was once the beautiful Norman-Arab west wall was destroyed at the time of the Baroque modifications. Which of the limestone blocks used in the cathedral's twelfth-century construction were taken from the prior structure? In particular, we note certain of the very large pieces which form the base of the lateral walls. Among the kings crowned here were Frederick II, who is entombed within, and in the eighteenth century Victor Amadeus of Savoy and Charles of Bourbon (later Carlos III of Spain), both commemorated by large, ornate plaques in the portico bearing their coats of arms. Depending on your point of view, Europe's Middle Ages ended around 1453 (coinciding with the Fall of Constantinople to Turkish forces and the end of the Hundred Years War, when Leonardo Da Vinci was a year old) or perhaps a decade or two later. By then, the Renaissance had arrived. A holy water font in marble was probably designed by Domenico Gagini while the Madonna della Scala was executed in 1503 by Antonello Gagini for the new sacristy. By 1600, in the wake of the Renaissance, movements such as the Baroque began to emerge. In Italy these styles supplanted the simple Romanesque and the true Gothic (Milan's cathedral is an exception). The shortcoming here occured not in the erection of churches and palaces in the new styles, but where existing structures were modified to reflect what was considered the epitome of artistic expression. In 1767 Archbishop Filangieri commissioned the Florentine architect Ferdinando Fuga to restore the structure. This was not intended to include drastic modifications, though parts of the interior had already been altered. In 1781 Fuga began his work, which was continued by Palermitan architect Giuseppe Venanzio Marvuglia into the nineteenth century. Marvuglia's changes were actually more extensive than what Fuga had envisaged. For example, Fuga wanted to retain part of the cathedral's original wooden ceiling. The principal dome (cupola), however, was Fuga's idea; it just so happened that it fell to Marvuglia to execute it. Marvuglia was a great architect who designed - among other aristocratic residences - the Ficuzza hunting lodge of King Ferdinand I. These comments aren't intended to disparage his talent but simply to question its use in so drastically modifying a splendid medieval structure. A large round window was added to the transept on each side of the nave. These are now filled in with stone. A clock was added in a tower near the apses. With the cupolas, these features disfigured the original design (the image below shows what it looked like without these additions). Here's a list identifying the cultural origin of each architectural element - please forgive some redundancy as many of these details have already been mentioned. Norman Elements and Motifs: The pointed arches and windows, and the four towers, are obviously original, though the towers across Via Bonello opposite the main entrance were rebuilt after collapsing. The crypt, the defensive battlements, and the vaulted ceilings visible in the clerestory are all typical of the Normans and other Western European civilizations. Byzantine Art: Initially there were at least a few mosaic icons inside the cathedral similar to those of the Palatine Chapel, Monreale Abbey and Cefalù Cathedral. All that remains today is a mosaic icon of the Theotokos in a niche above the archway under the Gothic portico, and a few details like the marble altar in the crypt decorated in mosaic inlay. These date to the cathedral's construction or perhaps a few decades later; it is obvious that the altar was first located upstairs in the church. The archway in the wall beneath the portico was built during the thirteenth century (see the next section). Another detail is the throne of King William II in the sanctuary; though restored, its essentially Byzantine style can be discerned. Swabian Gothic: The main entrance, used only on ceremonial occasions, is on Via Bonello. Rendered in gray stone, this is a typical gothic arch of the kind popular in Europe at the time, and there are numerous examples in Sicily. Despite our use of the term, this was not an exclusively Swabian or German style, nor was it specifically "Gothic." The Hohenstaufen eagle is visible on an escutcheon at the point of the arch. A similar but smaller arched entrance is located under the portico around the corner on the east side of the cathedral; carved around 1432, the wooden doors depict deer, wild boar, deerhounds and other creatures familiar to the Sicilian hunters of that period. Immediately above this arch is the niche bearing the Byzantine icon mentioned earlier. A similar arch, but in native limestone, is present inside, near the stairs leading down to the crypt, and the traces of frescos visible along the rims of the arched windows in the tower far above probably date from this period or earlier. Catalonian Gothic: The Catalonian Gothic portal and gargoyles (here angels rather than grotesques) were added in 1453. As we've said, the niche, arched portal and wooden doors are older. The three escutcheons immediately beneath the gargoyles display the coats of arms of the Swabian and Aragonese kings. Arab Elements and Motifs: The left (southernmost) pillar of the portico bears an inscription of the first sura of the Koran: "God is Allah and Mohammed is His Prophet." There are at least two columns in Palermo bearing similar inscriptions, including one just inside the entrance of Palazzo Steri. These columns were most likely taken from mosques, but the Sicilian and Spanish architects of the fifteenth century may not have even recognized the decorative writing as Arabic. In an isolated part of the clerestory, the muqurnas in a corner of the ceiling may have been preserved from the mosque but it is more likely that - like the ceiling of the Palatine Chapel - they were designed for this church. It is probable that others existed originally. The keyhole windows in the upper parts of the rear exterior (next to the apses) are very typically Arab or Islamic. Indeed, the apse area abounds with geometric motifs in black-and-white stone inlay and cut stone. Some cut-stone roundels can also be viewed above several windows and arches along the east side of the church. Baroque: Extensive restructuring of the interior took place during the eighteenth century, when the cupolas were added. Royal Heraldry: The Hohenstaufen eagle over main arch portal and the Aragonese insignia of the portico are the most obvious heraldry. The lion rampant guardant appears as a repeating motif profiled on a black stone background on the lower part of the large central apse (see the last picture of geometric details in the series above); this was a royal Judaic symbol adopted by the Norman monarchs of Sicily and England, and in the time of Richard Lionheart it formed the basis for England's earliest coat of arms. As we've mentioned, the Bourbon and Savoy coats of arms were added to the walls beneath the portico in the eighteenth century. Apropos royalty, the Crown of Queen Constance is preserved in the Treasury Museum along with several beautiful gemstone rings and seals. Royal Tombs: Roger II, first king of Sicily, and his grandson, Holy Roman Emperor Frederick II, rest here. So do Frederick's wife and mother (Roger's daughter), both named Constance, and his father, Holy Roman Emperor Henry VI. Bishops, nobles and a few ancient Roman citizens are entombed in the crypt - parts of which probably date from the construction of the seventh-century Byzantine basilica. The sarcafogous of Saint Nicodemus, bishop of Palermo from 1065 to 1072, is here. The remains of Odo of Bayeux, Earl of Kent, troublesome half-brother of William the Conqueror, were interred in the original cathedral; he died in Palermo in 1097 en route to the First Crusade during a visit to Count Roger, Sicily's first Norman ruler. It is just possible that one of the large, unidentified tombs in the crypt is his. About the Author: Historian Vincenzo Salerno has written for various publications, including this one.